Our new collection of made-to-measure shutters is designed to enhance your home and reflect your personal style. We’ve introduced more colour options than ever before, with a wide range of natural wood stains, ranging from pale lime to black walnut, and even more of the soft neutral painted finishes we know you love. And for a truly bespoke look, our custom colour service will match your painted shutter blinds to virtually any shade. Timeless and versatile, shutters complement both traditional and contemporary styles. Classic plantation shutters have slats that can be adjusted to control light levels, while solid shutters make a real style statement. All of our shutters are available with a water-resistant finish, making them ideal for kitchens and bathrooms. For a unique look that's practical too, consider pairing shutters with a pair of our stylish made to measure curtains. 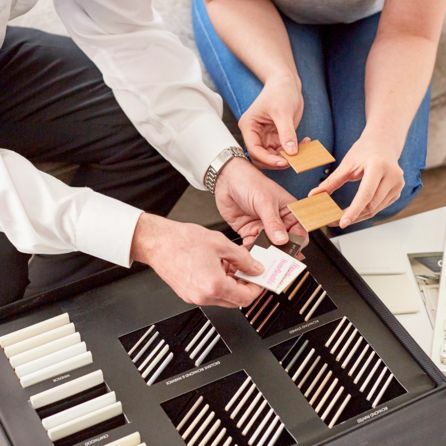 Our expert advisors will come to you at home, where they’ll advise you on the best options for your home and you can browse our entire shutter collection at your leisure. See what colours and finishes work best with your décor and get an idea of how your new shutters will look thanks to our advisors’ specialist visualisation software. Our shutters are crafted to fit even the most unusual shaped windows, including round and arched shapes, enhancing these unique features. 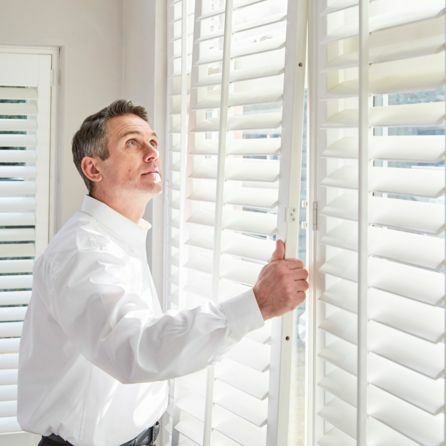 Once they’re ready, your advisor will return to fit your shutters for you, so you don’t need to worry about a thing.